Pears and fennel are a lovely combination together. We enjoyed this light, crispy salad this evening. It was especially nice with the soy cheese, and the ground fennel seeds in the dressing. Combine the walnut oil, balsamic vinegar, lemon juice and agave syrup in a small bowl and mix well. Grind the fennel seeds and add to the dressing. Chop the walnuts and toast in a dry pan. Once the walnuts are toasted, remove from the pan and place in a small bowl until needed. Slice the core off the bottom of the fennel. Cut the fennel bulb in half, and slice very thinly or shave using a mandolin. If your pears are organic, you can leave the skin on if desired, otherwise, peel the pears then slice thinly. 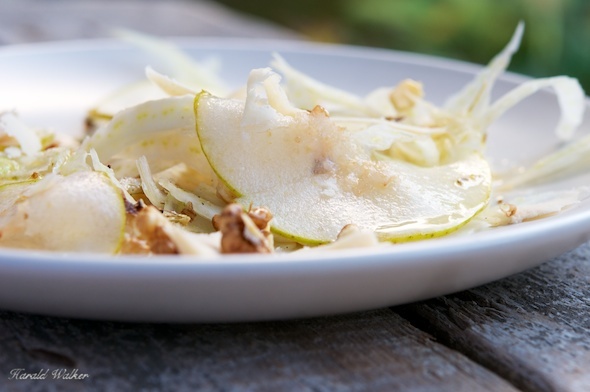 Mix the pears and fennel slices together and mix in a tabletop of dressing to coast evenly and retard discoloration. Divide the salad onto four individual plates. Sprinkle the toasted walnuts on top and shave or grate the soy cheese on top salad. Serve the salad with a carat of the dressing on the side. 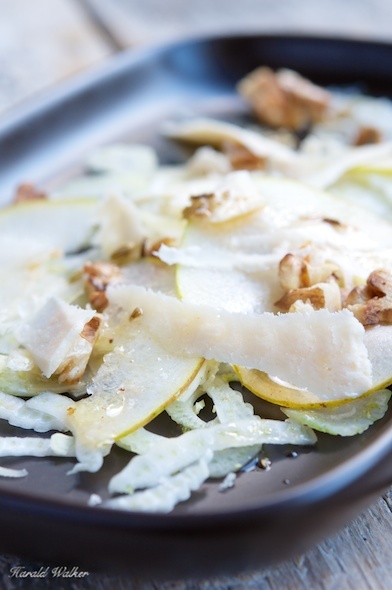 Posted by Chris Walker on October 26, 2012 in Fennel, Meals, Pear, Soy cheese, Walnut.